ECHL Week takes you to the games and behind the scenes of North America's "AA" hockey league. You'll meet players, coaches and other people who make the ECHL so popular. Did you know that over 4.6 million people attended ECHL games in 2017-18? 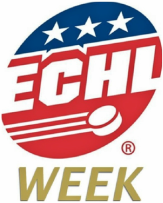 Stay up-to-date by following news from the ECHL.